x-nano™ Elite Black Pigment-Hybrid FastDry is specifically formulated for high-quality industrial high-speed inkjet printing of documents, labels, tickets, tags and packaging resulting in deep, rich black printouts. Ideal for High-Speed Printing. 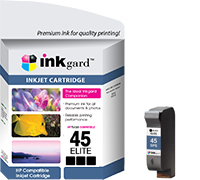 The x-nano™ Elite Black HP45 MPB (TIJ 2.5) Cartridge is specifically designed to maintain the ideal drop-size, viscosity, surface tension, and density for high-quality industrial high-speed printing. Use the HP45 MPB (TIJ 2.5) Multi-Purpose FastDry Black cartridge to print professional, executive, and marketing documents at high-speeds and unmatched in quality. The high-density formula yields deep, rich black print outputs that resist fading, smearing and chemical alterations - they are virtually everlasting! x-nano™ Elite Black Multi Purpose Ink is a Nano Pigmented Ink specifically formulated for high-quality inkjet printing of documents, and photos resulting in deep, rich black print-outs. Use x-nano Elite Black for better optical reading of OCR-A and OCR-B prints. Elite Hybrid Pigmented Ink is based on a new family of xNano-particles, formulated with special ingredients, to achieve an unprecedented black coverage and ultra-smooth appearance on various substrates. Like the MICR ink Black series, "Elite" is available for desktop, industrial and commercial print applications utilizing thermal and piezo print heads available from a variety of manufacturers. Ideal for High-Speed Printing - This unique solution with its nanometer size pigments maintains the ideal drop-size, viscosity, surface tension, and density for high-quality industrial and desktop inkjet printing. Enriched Black - Elite Black’s high-density formula yields deep, rich black print outputs that do not smudge and still save on ink consumption. Enhanced - Get long-lasting cartridges. x-nano’s™ Elite black’s unique formula provides for up to 20% lower ink consumption per page than standard ink while retaining consistent, rich and saturated black print quality. EdgePrecise™ - Ultra-sharp print quality for documents and images. Ultra-Durable - Resistant to fading, smearing, and chemical alterations. Unaffected by extended light exposure and chemical alteration. Documents, images and checks printed with Elite Black are virtually everlasting and durable against organic and inorganic solvents.